Today I'm going to be discussing the practice of keeping hermit crabs as pets. I'm sure you know I've had two young hermit crabs since September named Brigadier and Lola. They are fabulous pets! A lot of people will impulsively buy a hermit crab and not do much with it. Some people buy them for their kids without knowing the expense and effort that hermit crabs require, thinking they will be a fun little throw away pet that will only last a few weeks or months...with improper care, they truly will last just a few weeks or months, but they usually live for many years. Some people will get a small plastic carrier tank, some water, crab pellets, and maybe a crab toy or two and call it a day. But hermit crabs are a lot more complicated than that. Some people are unaware that they're pretty much abusing their poor hermit crabs by keeping the conditions of their tank poor and not providing the crabs with what they need, along with giving the crabs no friends or attention. Crabs can't just life off of pellets. 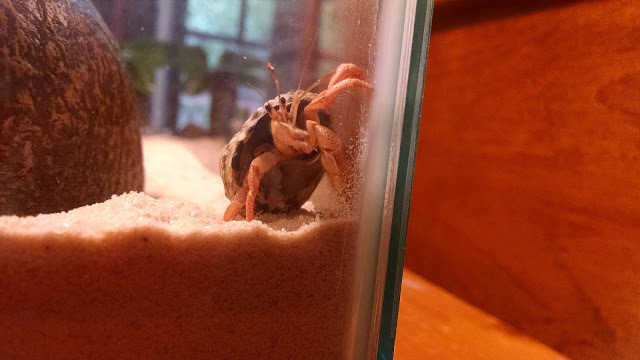 Yes, my crabs love pellets, and they get pellets every other day, but they never have just pellets. They are served other nutritious things, like carrots, spinach, oats, shrimp, and other things. They need a large variety of foods to thrive. Do you think hermit crabs on the beach eat processed pellets everyday? The pellets I give to my crabs are very nutritional and are more a powder. It promotes a strong, healthy exoskeleton, which is important when crabs are molting, which I assume Brigadier did a few weeks ago. Let's talk about that, shall we? Every 10-18 months, hermit crabs will shed their outer skin, which is called molting. Crabs should never ever be disturbed or dug up during this time! Lola is currently in an isolation tank (a slightly smaller tank with all of her necessities) to keep her away from Brigadier. Even if Lola were to touch Brigadier, it could kill her friend. It could stress Brigadier out or harm her weak body during the molting process. So, if you suspect your crab is molting, do not touch it or dig it up! Instead, lightly mist the area you suspect your molting crab is in once a day, and purchase a good sized tank to keep your other crabs in during the process. Many people don't know that hermit crabs need both saltwater and normal water in their tank, and tap water is not an exception. I use a special kind of bottled water for my crabbies, and I use fish tank salt and mix it in with some of the water for their saltwater pool. Hermit crab salt usually isn't harmful to hermit crabs depending on the brand, but fish tank salt mixed with water stimulates more of the hermit crab's natural environment. However, there wasn't any fish tank salt last time we went to Petsmart, so I decided to go with hermit crab salt. Table salt is toxic to hermit crabs! Some people will bathe their hermit crabs, but as long as they have water to wade in in their tank, they'll be fine. Bathing them yourself can stress out the hermit crab! Also, if the tank's humidity isn't high enough, your crabs will have trouble breathing, something that most amateur hermit crab owners might not be aware of, yet they could slowly be killing their crabs! Hermit crabs need lots of space. My two tiny hermit crabs currently reside in a 10 gallon tank. They have more than enough room in there! I can fit everything they need in their tank and they still have a ton of room to roam around in the sand. I could probably fit four more small hermit crabs in there if I wanted to! Hermit crabs should never alone...they can sometimes live in colonies of over a hundred crabs out in the wild! They are only called hermit crabs because they can hide in the shells on their backs...they're actually extremely social, affectionate, and unique creatures. This is just part one today...I have too much to discuss when it comes to properly caring for hermit crabs. Most people sadly don't understand what hermit crabs need. Please come back tomorrow for part two, and a part three might even follow that! I did not nose about crabs molting until Sarge and the Crabby Girls said......didn't nose just what a dangerous time it can be fur thems. No problem! I felt like I should highlight the crisis of improperly taking care of hermit crabs today and later this week. Most people don't realize how much of a problem it is. Most excellent post today! My crabby girls are clacking their claws with glee. It's also important to keep it warm in there...along with moist. They like it tropical. 74 degrees or warmer and humid. Great info!! Wow! Thanks for the info. People used to keep anole lizards as pets but did not take proper care of them. They would die within a few weeks or months. Poor little lizards! Aww, that's sad. I like anole lizards. :) Sometimes they'll be around our yard in the summer and I like catching them and setting them free a few minutes later. We see that Beachnut and Shelldon have been by and are Clacking their Claws fur this Fabulous post... WELL DONE!!! What a great post! We know the Crabby Girls over at Sarge's place will love it too! Yep, they already stopped by! Wow - we had no idea there was that much involved in caring for a hermit crab! And this is just part one! :) But it's SO worth it! My Mom learned about hermit crabs from the Crabby Girls but this was really interesting information. She grew up near the Oregon coast so she saw lots of little crabs and fishies but never had one as a pet. We're looking forward to the next article. I'm glad you came by today, Abby! I'm also happy that you enjoyed this article...the crabby girls are fun to have around Blogville, eh? Thanks for sharing all this great information about Hermit Crabs. I learnt a lot of things today, many thanks... I hope all crabby friends will live in a crabitat like yours or sarge's, it's sad to live in a small plastic container, isn't it? Hi Robin, that was an excellent April Fool's day joke. You definitely got me with that one. Love your blog. Always entertaining and full of information. Thanks! I'm glad you love my blog!